Some nerves stretch over large distances from their origin in the Central Nervous System (CNS) to their final destination in the skin, muscles, glands or organs, going through different anatomical areas and even body cavities. Nerves go from one area or cavity to another one by going through holes and channels made of connective tissue, and in some cases through a bone channel, be it total (mental nerve) or partial (carpal tunnel). It is in these narrow passages where nerves can get trapped and so injured. This may be due to anatomic anomalies present since birth, due to muscle, nerve, or connective tissue hypertrophy, due to cysts (e.g. ganglion cyst), tumours, and in some cases it may even be due to traumatisms in the area, be they spontaneous or surgical. 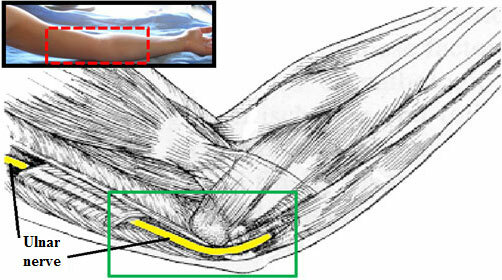 Consequently, nearly all nerves might suffer a nerve entrapment syndrome, deriving into many entrapment syndrome types. The most frequent ones are the carpal tunnel syndrome, followed by entrapment of the lateral femoral cutaneous nerve (lateral cutaneous nerve of the thigh) in the anterior superior iliac spine (ASIS), and of the ulnar nerve in the elbow. Other, very rare syndromes are those caused by entrapment in the upper thoracic outlet and the piriformis muscle in the buttock. The treatment in these cases will be to decompress the nerve and eliminate the connective tissue, muscle, or bone causing the problem. The mayority of times this will end the problem; but if pain is not releived a neurostimulator, which will help block the transmission of the pain signal, can be applied over the nerve.